We did go on to have several months of seizure freedom. During those months Trevor continued to make developmental progress in spite of his abnormal EEG. Which remained intermittently spikey over the left side. I never had a peace settle over me that our journey was over. I always had this hunted feeling. Like we were being stalked by the Seizure Monster. But our neurologists insisted he was on a positive path – so I set my heart towards trying to believe them. Speech was our biggest tangible concern back then. 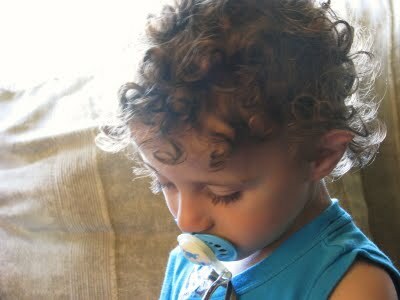 He never seemed to respond to language – Early Intervention assured us speech delay was normal with boys. Of course, Trevor was my 3rd child so I had some experience with Language Development. Toby and Bristel were early bloomers. Both speaking in sentences before they were 2. I wasn’t convinced Trevor was just going to be my pokey talker. The majority of his subclinical seizure activity was occurring throughout his left hemisphere but appeared to primarily be originating in the temporal lobe region. The left hemisphere is responsible for speech. When he was 13 months old, a Boston Children’s neurologist brought up the topic of removing his left temporal lobe if speech continued to be significantly delayed. He said as long as the “broken brain” was in there it would try to do the job and would never be successful. If we removed it – it would allow the miracle of rewiring to the healthy right brain to occur. The younger the patient – the better the outcome. The idea of brain surgery wasn’t new to me. I poured hours into research and various support forums and had already learned of several IS children who’d had portions of their brain removed. Many of them in Detroit with Dr. Chugani (whom I fondly call Dr. Rockstar). It was radical. But so is catastrophic epilepsy. The next year plus some was immersed in seizures and med trials. Testing this. Trying that. Cocktailing these. Titering those. Nothing worked. 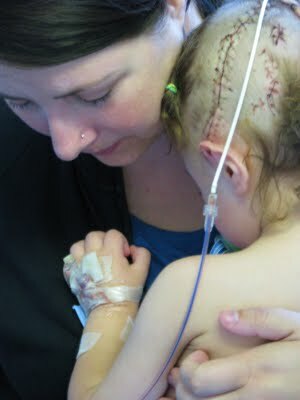 His EEG was no longer only spikey over the left brain. It was a generalized (involving both sides of the brain) hypsarrhythmia (specific EEG pattern associated with Infantile Spasms) mess. The spiking on the screen looked like toddler scored a box of crayons. 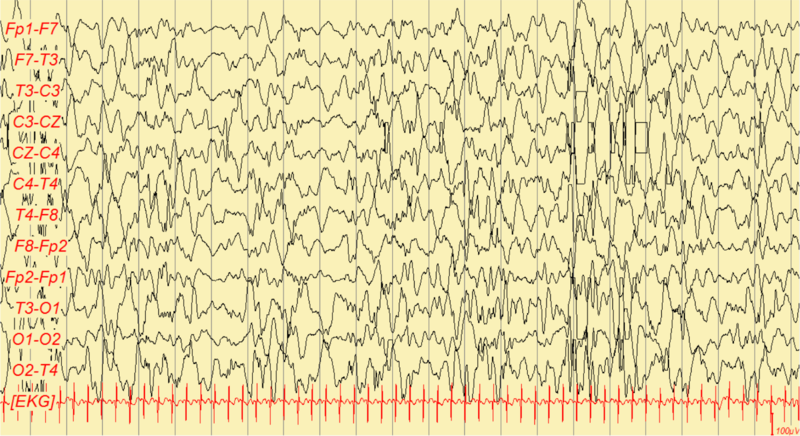 (healthy normal EEG of a baby) Photo found here. All that disorganized chaos reflected the electrical storm waging under the crop of curls and super cute face. So many seizures. Hundreds of uncountable seizures. Every single day. From the time he woke up until the time he went to sleep. He was a walking seizure. He would cluster all day long. Each cluster could last from 5 – 30 minutes and involve as many as hundreds of back to back seizures. I stopped trying to track them. It was exhausting. Yet rest did not bring him respite. Infantile Spasms is most aggressive when the brain tries to rest. Sleep is so important to growing babies because this is when the brain takes all the information it has processed throughout the day and organizes it. Learning cements during sleep. This aggressive increase in seizure activity during that precious learning time arrests development. And causes developmental regression. A growing brain cannot sustain perpetual insult without resulting in arrest and eventually loss of function. We watched Trevor’s global development slip from a month-ish behind his peers to significant delay. When he was 28 months old, an evaluation placed him globally functioning around 10 months. He was developmentally frozen at the point his spasms relapsed. We had exhausted medications. Sure there were more to try. But the likelihood of being effective was nil to none. We had reached the desperation point. Which I guess, is where you need to be when you finally decide to passionately pursue surgical intervention. I had flirted with Dr. Chugani in the past and did so again. Because I needed Hope. He is the rare breed of doctor who cares enough to offer himself via email to parents of children with catastrophic epilepsy. There are many, many parents whose children are not his patients and yet he takes the time to answer their questions. Offer guidance. On this very dark, murky road. Jonathan’s dad passed away from Pancreatic Cancer during this time. My parents kept the kids so we could attend the funeral together. It was shortly after the ceremony that my cell phone vibrated. Chugani was on the other end. And I can’t deny, it felt like a sign. I was already eyes weepy and hands shaky as he expressed feeling that Trevor could be a surgical candidate. Based on my shared data and the single test (a PET scan) he studied for me pro bono. Having not actually preformed any testing himself – it was just his guess. But it was enough. To get my hopes up. It’s just that Detroit is an awfully long way from Rhode Island. So we decided to pursue surgery locally first. The best choice was Boston Children’s. Where we were sorely disappointed. 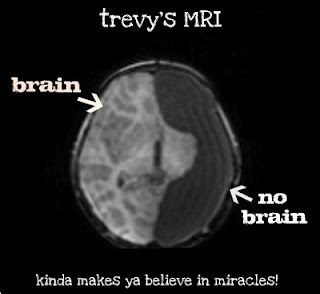 The neurologist we were referred to wouldn’t even present Trevor’s case to the surgical board. He said his seizures were generalized and that his EEG was trending towards Lennox-Gastaut Syndrome (LGS). This was the same guy who once mentioned removing a lobe. But that was before the relapse. Now, he was telling us the most we could hope for was some form of seizure control but that Trevor would never be seizure free and would likely never talk. It’s not even that we were surprised. Or that any of the information was new. It’s just that the amount of emotional energy it takes just to survive these meetings is astronomical. All of the hope we’d poured into pushing for surgery – dashed – just like that. Appointments like these have a tendency to leave me little more than a puddle on the floor. But that hope. Dr. Chugani had breathed that hope in my heart. And I knew I had to pick up the shattered pieces and move forward. I knew I didn’t want to waste any more time. “The younger they are – the better the outcome” echoed inside my head at all times. Which meant it was time to get serious and schedule an appointment with Chugani himself. I also knew it wasn’t going to be easy to convince our insurance to approve this way out of state & network facility and neurologist. Especially, when our local hospital clearly disagreed. And in fact, Trevor’s primary neurologist quietly referred us (meaning, she didn’t run it by her superiors) to prevent any further delays or barriers. And it was no easy feat. I lost track of the hours I spent on the phone. The number of letters written. Arguments made. Sleep lost. Pounds gained. Tears shed. Somewhere over those months my passion for surgery morphed. In the beginning, it was entirely (selfishly) about the cognitive benefits it could bring him. We had already watched him make developmental progress before – when the seizures were controlled. But as time flowed on, it became more about giving him a better quality of life. I would have given anything to stop those damn seizures from attacking him. Saturating him. Slowly stealing him way. And after months of advocating…our insurance agreed to let us pursue surgery with Dr. Chugani’s Dream Team. Toby’s (my oldest) baseball coach donated his air & hotel points for our surgical consult flight to Detroit. I won’t go into all the gory details…but trust me…the trip was filled with B-movie drama of it’s own including severe weather almost causing us to miss our connection! I can’t resist sharing one particular incident. We had successfully secured seats on THE LAST flight from Philly to Detroit and some yahoos were trying to guilt trip us into giving them up. “But we’re headed to a funeral,” they said. “We’re en route to see if a neurosurgeon will agree to remove half of this beautiful little two year old boy’s brain as a radical last measure to control the hundreds of seizures he survives on a daily basis,” we responded. They moved along and we made it to Detroit late that night. We returned home even more weary and promise-less. Later learning there was much debate over Trevor’s case when the surgical board met. Because Trevor has no tangible findings on his MRI along with his generalized (meaning seizures occurring in both hemispheres of the brain) EEG – it was not a clear cut decision. Dr. Chugani argued his case – and finally persuaded the team. He would later tell us during post-op rounds that he couldn’t let a child continue to have 100s of daily seizures if there was even a small chance. August 17th, 2009 was the day we learned that Trevor was a candidate for radical brain surgery (a left subtotal hemispherectomy with MST to motor cortex) with Team Detroit. I’m not superstitious or anything, but I had stopped cutting Trevy’s hair when we made the decision to chase surgical intervention. Over the months he’d grown a mop of beautiful surfer’s curls. Just a handful of weeks after our consult appointment, the OR nurses took turns running their fingers through his beautiful surfer curls before shaving most of them off. And sweetly saved a baggie for us. There are so many details and emotions to share about those Nightmare Miracle days…weeks. Too many, really. A friend recently asked me how we made the decision to have half of his brain removed. I don’t know that I can adequately answer that question. At least not in a way that someone who hasn’t walked this road would be able to wrap her heart around. Certainly, everything I’ve shared already played a role in leading us towards surgery. It was truly the final resort (though, I personally believe neurologists treating catastrophic epilepsies should consider surgery more aggressively – rather than forcing willing but emotionally exhausted parents to find the strength to push for it). We were out of viable options. If surgery wasn’t on the table…our story would be different. But it was. And Jonathan and I had made a promise together. During those early days just after we heard the words Infantile Spasms for the first time. We held each other and promised that we would always choose the most aggressive treatments, no matter how scary, to give Trevor the best chance. That doesn’t mean we have an extra supernatural dose of courage. Or are immune to deep, bone shaking fear. The same fear that quaked us to the core when we gave him that first injection of Acthar quaked us to the core again when we kissed him goodbye. And as we held each other weeping and watching his bed roll away to the surgical suite. Of course, we’re on the Healing Side now. As I like to call it. The surgery is two years behind. So are Infantile Spasms. We have watched the Trevy we knew was locked underneath those seizures blossom these past two years. It’s easier to smile now and relax into knowing we made the right choice. For Trevy. Of course, he’s only just about to turn five which means our journey is far from over. I’m still advocating hard for him. It’s still exhausting. I’m still researching and pushing. I can still be found stress eating. He still has epilepsy. Though thankfully more responsive to medications. We’ve walked down the road a little bit further now. Some of the “what ifs” have been answered. Some of the drama already lived. People love the idea that he’s such a Miracle. For Trevor and all of his friends with catastrophic epilepsy, please share the story of the miracle of his life. I already knew the story and it still made me tear up. Trevor is a true miracle!